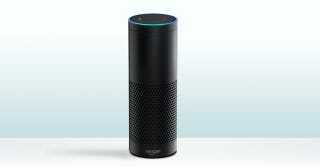 Amazon Echo is a speaker that has a voice assistant built in. If you ask it a question its got an answer. If you tell it to do stuff, it complies. Well, this is different. Echo is an always-on speaker that you plop into a corner of your house and turns it into the futuristic homes we've been dreaming about. It's like Jarvis, or the assistant computer from Her. When you say the wake word "Alexa," it starts listening and you can ask it for information or to perform any of a number of tasks. For example, you can ask it for the weather, to play a particular style of music, or to add something to you calendar. Of course voice assistants aren't an entirely new concept, but building the technology into a home appliance rather than into a a smartphone makes a lot of sense and gives the technology a more conversational and natural feel. To that end, its got what Amazon calls "far-field recognition" that allows you to talk to it from across the room. It eliminates the clumsiness of assistants like Siri and Google Now that you have to be right on top of. Besides being an assistant, Echo is also a little Bluetooth speaker with 360-degree sound. It stands 9-inches tall, has a 2-inch tweeter and a 2.5-inch woofer. If you're not near the speaker, you can also access it using an app for Android and Fire OS as well as through web browsers on iOS.